Chemicals production in China is expected to increase 8.5 % in 2015 following the 8.8 % growth rate registered in 2014. 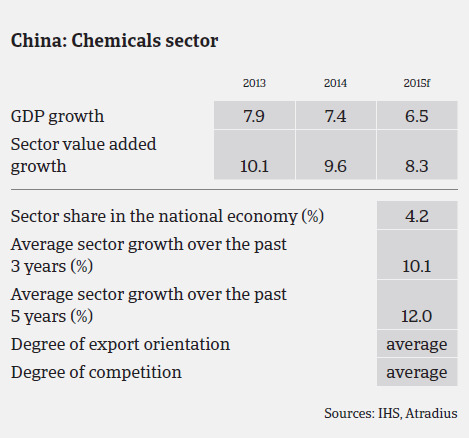 The chemicals industry is entering a phase of slower but still solid growth, following the slowdown in Chinese GDP growth (forecast 6.5% in 2015 after 7.4% in 2014). Chemicals production in China is expected to increase 8.5% in 2015 following the 8.8% growth rate registered in 2014. Overcapacity in the industry however is a growing issue as demand is weakening in some important buyer industries. At the same time, production continues to expand, leading to domestic supply significantly exceeding demand. For example, overall capacity utilisation in the ethylene production segment was just at around 70% in 2014. Many subsectors face oversupply because of the investment-led growth model that has resulted in excessive spending on new factories in the past. China is still constructing a large number of production facilities — both mega and medium-scale — undertaken by Sinopec, PetroChina, CNOOC and other state-owned enterprises. In 2015, certain subsectors are likely to grow more strongly than others, e.g. the robust demand for automobiles will boost the synthetic rubber and polyurethane segment. While plastic production growth was high in recent years, this growth is now affected by the cooling down of the property market and lower consumer spending. The slowdown in building activity has a negative effect on PVC producers, as construction is a major consumer of PVC for windows and polymer tubing. However, there are government plans to reduce surplus capacity in China’s PVC feedstock sector. Therefore, the slowdown may not have a major impact on PVC prices. The performance of the Chinese chemicals industry is still hampered by a lack of advanced technology, despite government efforts to accelerate the acquisition of Western know-how. Many Chinese firms do not invest in research and development and rely primarily on imported technology. Smaller Chinese chemicals firms are burdened by low levels of efficiency and poor economies of scale. Most Chinese companies in the sector produce low-end goods, and profit margins remain very low for some producers. As China badly needs foreign chemicals technology, the government is actively encouraging joint ventures between foreign companies and state-owned enterprises. The benefits for foreign companies investing in China include a growing domestic market in which they can sell their products, and low construction and labour costs when building greenfield projects. 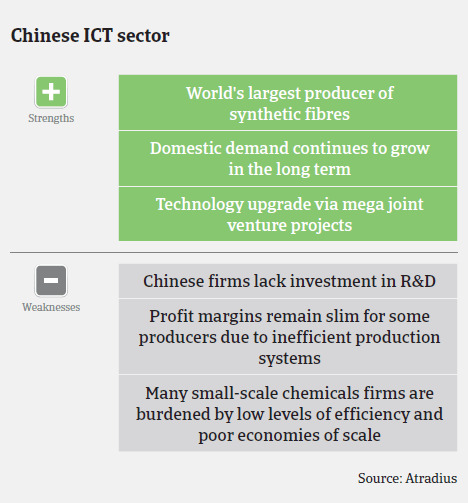 In the long term, China’s growing industrialisation and urbanisation will provide further growth opportunities for the chemicals industry, and an expanding middle class will require higher-quality chemical products. As a result of increasing environmental problems, the Chinese government has moved to restrict the construction of small scale and environmentally risky chemical plants. The ban targets local entrepreneurs, who have built numerous small-scale chemicals units throughout China during the past few years, many of them based on obsolete technology, inefficient and a threat to the environment. Regarding the pharmaceuticals sector, China remains a key emerging market for multinationals, with double-digit rates of sales growth. In 2015, pharmaceuticals spending is expected to increase 11.7% year-on-year in USD terms, to USD 110.26 billion, while healthcare is expected to grow 13.5%, to USD 686.7 billion. We expect pharmaceuticals expenditure in China to continue recording high growth rates in the coming years, as growing development and prosperity will lead to higher spending for medical services. Overall, the equity strength of Chinese chemicals/pharmaceuticals businesses is still relatively good, as the major players are large corporations (usually with a state-owned background) or large joint-ventures with multinationals. Compared to other industries like steel and textiles, chemicals companies, in general, appear to have better solvency and liquidity ratios. On average, payments take 60 to 90 days, and payment delays and defaults are not expected to increase in 2015. However, small privately-owned chemicals producers, with a low value-added contribution, often suffer from squeezed profitability, leading to solvency and liquidity problems. Moreover, they will be mostly affected by environmental protection actions, i.e. when sub-standard factories will be suspended or shut down. 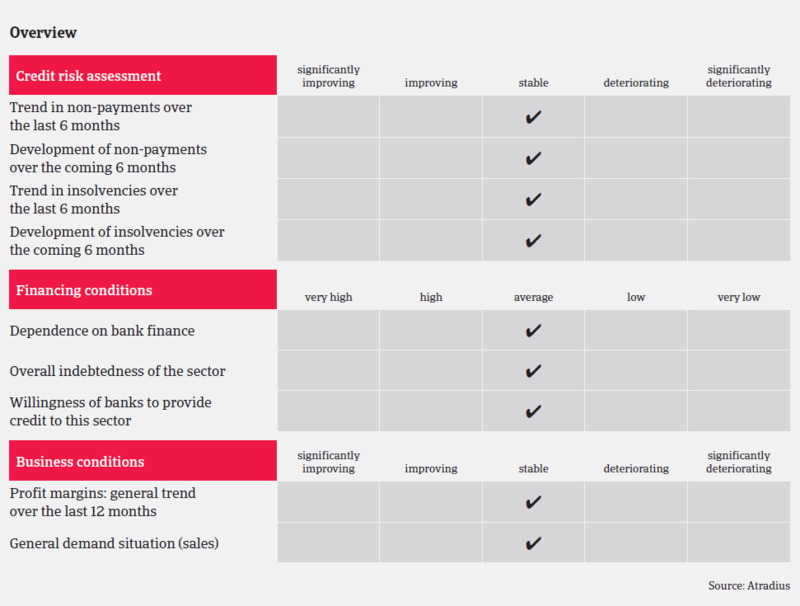 Our underwriting stance on the Chinese chemicals sector remains neutral, and we assess buyers on a case-by-case basis. In general, the credit risks associated with buyers that have a strong background (state-owned or with a parent company that is a key player) are always lower than for small privately-owned businesses. Therefore, our underwriting stance on smaller private businesses (both producers and traders/distributors) in the basic chemicals sector is relatively restrictive because of slim margins and the fierce competition caused by low barriers to entry. Many small-scale Chinese petrochemicals firms are burdened by poor efficiency and little opportunity to derive economies of scale. Due to strong growth rates and high profitability, our underwriting stance is more open for pharmaceuticals than for chemicals. Again, for many small privately-owned pharmaceutical distributors we maintain a stricter strategy because of limited transparency and a lack of insight into buyers´ real strength. Official financial information often does not reflect businesses‘ real financial situation, and therefore obtaining internal accounts is vital in order to accurately assess creditworthiness.